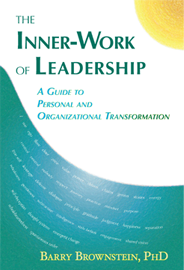 It has been a little over a year since my book The Inner-Work of Leadership was published. In that time the market’s shift to ebooks has been noteworthy. And now with the closing of Borders Books, that trend is likely to accelerate. Today, I’m happy to announce that The Inner-Work of Leadership is now available in both a Kindle edition and a Nook edition. For a limited time, the introductory price is only $4.95. The Inner Work of Leadership is an outstanding contribution! One of the most important books I have read. As each page turned the narrative took me gently, deeper and deeper into the world of conscious leadership. Its words inspire the open hearted and open minded to make their inner work their primary responsibility in life. Powerful possibilities tumbled out of my mind as I was drawn to reconsider the world of authentic collaboration, cooperation, creativity and productivity. The prize, a more loving, sustainable workplace and world, became clear as the critical nature of shared purpose unfolded. A world of abundance beckoned as you read in example after example the convergence of doing what works with what matters in a context of love, understanding, wisdom and common sense. When a brilliant old friend of mine recommended this book to me, I knew it had to be good. I just finished, and now I know: “good” is an understatement. This is one of the three top leadership books I’ve ever read, and it surpasses the other two because its lessons will help me be not only a much better leader, but a much better person as well (though I guess I have those two backwards in order of importance!) First there was the shock of realizing the true meaning of the notion of distributed knowledge (which I thought I’d long ago embraced and internalized, having read Hayek, Read and others on the subject): No, I can’t and don’t know everything, or anything close to everything, and nor do I have to! In fact, it’s best if I don’t even try! Then came the amazing lessons about letting go of the ego and truly focusing on the people around me. The Inner-Work of Leadership proved to be a grab-bag of phenomenal ideas. As an aside, I found it intriguing how many of Brownstein’s sources and recommended readings were from authors I’d already discovered – not only in the leadership realm, such as Charles Koch (who wrote one of the other two of my favorite leadership books), but much farther afield, including Viktor Frankl, Christopher Alexander, and even Dr. John Sarno! But even with all that previous common discovery, his book tied it all together and gave me one of those rare and valuable moments of, “Of course – it should’ve been so obvious!” that so often mark the truly groundbreaking. Thanks so much, Professor Brownstein. You’ve made my life better. How many authors can ever claim such a thing? Purchase your own copy—paperback or for Kindle at Amazon. At Barnes and Noble the book is available as a paperback or for Nook. Insanity, Einstein advised, is “doing the same thing over and over again and expecting different results.” The Inner-Work of Leadership offers another way. You will be guided to do your inner-work to discover hidden beliefs that stand in the way of your genuine personal and professional transformation—and the transformation of the organization you lead. If you haven’t read the book already, take advantage of this opportunity to own your own copy. If you know others who are ready to do the inner-work of leadership, this is a great time to recommend the Kindle edition at the introductory price of $4.95. I appreciate your support in getting out the word.